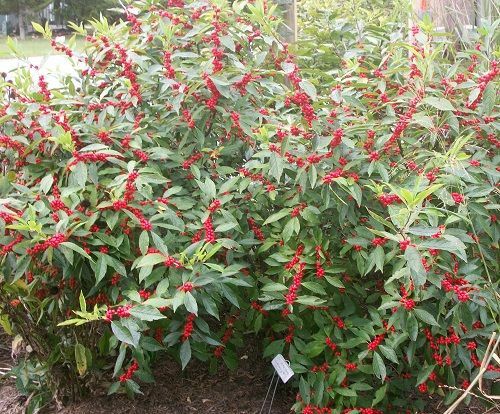 Dense, dark green foliage with bright red berries for winter interest. Upright, conical grower. Best berry display with a male pollenizer nearby such as 'Blue Prince'. Evergreen, requires little or no pruning. Deciduous, slow-growing holly with an upright, rounded habit. Small dark green leaves, no berries. Male pollinator for Winter Red. Adapts to a wide variety of soil conditions. Prefers moist, acidic, reasonably fertile well-drained soil. Deciduous, oval to rounded shrub. New foliage emerges showy red, becoming rich, deep green. Bright red berries appear from late summer to early fall, attracting birds. Requires a male pollinator like Southern Gentleman for good fruiting. Deciduous, upright mounded holly. Prolific bright red berries that endure through winter (when planted with Southern Gentleman as pollinator), and attracts birds. Native to eastern US, highly adaptable. Dwarf version of 'Henry's Garnet'. Fragrant, wispy, white summer flowers that attract butterflies and hummingbirds. Green summer foliage turns to brilliant red in fall. Deciduous. Very hardy evergreen spreader with dense, upright branches clothed in sharply pointed needles. Unique light blue foliage. Requires little maintenance. Sheared annually and root pruned for highest quality. Deer resistant. Fastigiate form. Very useful in landscape work. Prolific grower, makes excellent snow or wind screen. Keep sheared to maintain upright habit. Deer resistant. One of our most popular plant introductions. Attractive, upright pyramidal grower that fills rapidly with minimum shearing. Crisp bright green foliage on dense, tight branches. Prized for its versatility as a screen or for garden background. Tolerates drought and poor soils. Deer resistant. Horizontal spreading habit. Bright yellow-gold foliage, turning bronze-yellow in winter. Full sun needed for brightest gold color. Low maintenance and very tough. Tolerates drought and poor soils. Deer resistant. Compact spreader with mint green foliage on dense arching branches. Darkens in winter with little or no bronzing. Makes good hedge or foreground planting for landscape beds. Very attractive plant as it matures. Full sun preferred, but will tolerate some shade. Low, spreading groundcover juniper. Dense blue-green foliage. No shearing needed. Heat and drought tolerant. Deer resistant. Wholesale Only – Trade Inquiries Only – Call for Availability!